Begin this year Heinemann published a biography of J.R.R. Tolkien in their Writers Uncovered series. It is titled "Writers Uncovered: J.R.R. 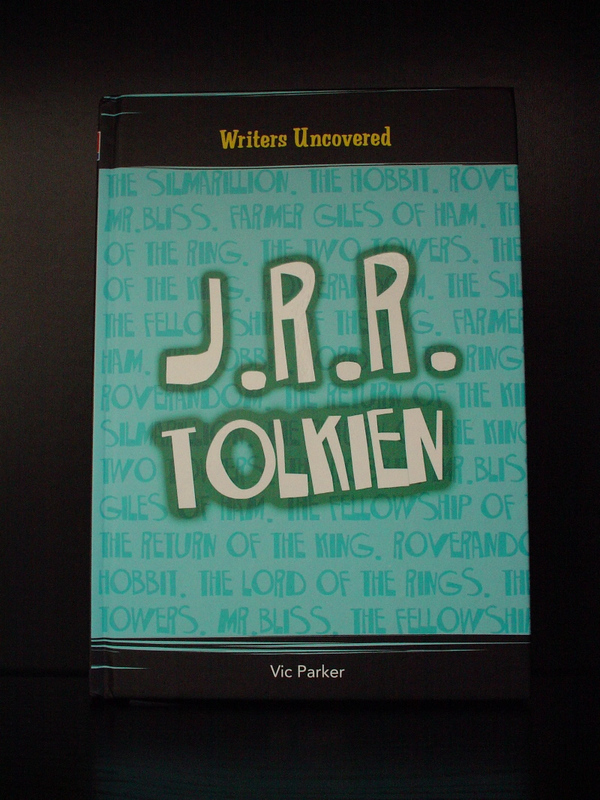 Tolkien" and is aimed at children aged 7-14. Most parents like to read books for their kids; for sure I’m such a parent. One of the tales I like to tell is Mr. Bliss and read a load from the Hobbit. My older children did of course read the Hobbit and have seen the Lord of the Rings. This little book is aimed for the children who, after reading the books or seen the movies, want to find out more about the author behind the stories. In the series we can find more of my children’s favorite British authors like C S Lewis, Jan Mark, Roger McGough and Terry Pratchett. All the books in the series tell all you need to know about their lives and works and include an introduction to and analysis of key works, deconstruction of a review, ‘Have a go' boxes to encourage creative writing. The concept is brilliant, but the book even more so. While the book is aimed at children and the layout of the book is created to please their eyes, it can easily be enjoyed by adults. One of the best things about the book are the photographs, there are some very nice pictures from Tolkien, his house, the place he liked to go, the trenches of WWI, a picture of Lewis, Oxford, Bournemouth,… it is all there. Most of the book is a biography, walking through Tolkien’s life from his birth to his death. In between there are sections called "Have a Go" where readers are encouraged to try out activities, such as writing your own review of The Hobbit, trying to find ou where words came from for yourself (after explaning the word “philology”). Other sections include "Find Out More" and "Inside Information" which give extra background information - such as Tolkien’s favourite food, sport etc. After the biography the book moves onto describing the Middle-earth related Tolkien books, starting with the Silmarillion (this is very nice in it self). We get a compact description of the plot, the main characters and publication dates. Although the biography is aimed at kids it did contain some information that was new to me, like that his first car was a Morris Cowley and that he had named it Jo. This book is very nice and I recommend it to all parents. I wished that when I was a kid this series existed; it would have given me much pleasure. Funny to say, but it even does now. The book costs 12.50 GBP and contains 48 pages including the index. Vic Parker grew up in Sutton Coldfield and instantly loved reading. She was educated at schools in the Birmingham area and then at St Catherine's college, Oxford. Vic moved to London and began working in children's publishing as a Personal Assistant at Letts Educational. She then moved to Usborne and spent two years training as an editor and writer. Later Vic moved to Hodder Children's Books as Commissioning Editor for Non Fiction and also created a children's poetry list. In 1996 Vic went freelance in order to develop her own writing. Recently married, Vic balances her time between writing and teaching dance and aerobics classes to adults and children.